As many as 100 Early Childhood Education (PAUD) teachers in Seribu Islands Regency got competence and quality improvement training. "The training given is about teacher's behavior and act, as well as and skill and knowledge improvement "
Director of PAUD Institute, Dhanang Sasongko said that with the training hoped the teachers could form the students who are evenly at the age of 3-4 years old to be quality children.
" The training given is about teacher's behavior and act, as well as and skill and knowledge improvement ," he said, Thursday (12/17). In the training, he told, the participants were given some teaching technique that students are interested and active in studying. "There are story telling, move and song, educative playing technique and interesting scientific lesson for students," he told. He expressed, not all of teachers in Seribu Islands invited but only those teachers who have never given such training. 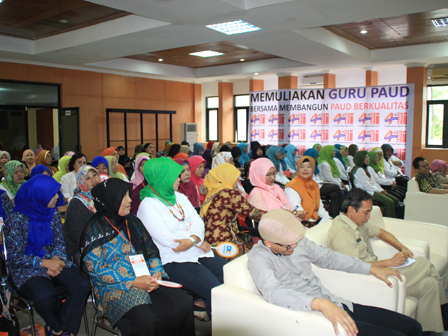 "Currently in all over Jakarta there are about 4,000 PAUD teachers," Sasongko explained.